It may not seem like it, but your garage door springs bear excessive weight and tension every time the door is clicked open or closed. If your door springs are in good working condition, your door opens smoothly every time. If the springs are in poor condition, they could snap with no warning and the metal parts will fly around the garage damaging anything in their path. If this happens while the door is open, there is a good chance the door itself will come crashing down on any object or person underneath. You can make sure your door springs are always working properly and safely when you call for our professional services. Installing or replacing a spring is a complicated process that requires specialized equipment, parts and expertise. This is one of the most dangerous services we provide. The tension and weight that each door spring bears means that if any step of the installation or replacement process is not properly performed, anyone within reach could suffer severe injuries. This is why we also highly recommend you don’t try to even inspect, let alone replace, the springs yourself. Our experts will arrive with all the right parts and equipment needed to perform a reliable spring check on the spot, no matter what kind of garage door you have. Whether you simply need the spring to be replaced or if the pulley’s worn through, the safety cable is frayed or the bolts are coming loose, we will arrive with a wide range of accredited parts to ensure we can replace them on the spot. Your springs come with a limited life span and a warranty, but that doesn’t guarantee they won’t wear down or break well before. If your door is creaky, it’s most likely that the springs need to be professionally inspected and serviced. Our professional technicians have the knowledge and equipment to inspect your springs for any weak points, unusual stretching, rust or signs of imminent breakage. If your springs are showing the early signs of corrosion or rust, we can lubricate them and test them to ensure you get the maximum use out of them. Alternatively, they may simply have been improperly installed and need an adjustment. In any case, our experts will make sure that when we leave, you can be confident that your springs are safe and in top working order. 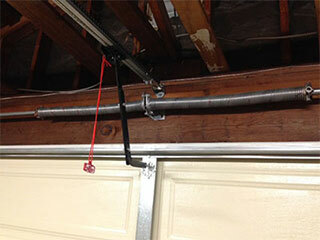 For any kind of garage door spring installation, maintenance or replacement, call our team of experts today!